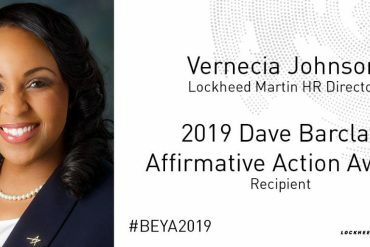 A long line of engineers have left quite a legacy for the three-decade-old Black Engineer of the Year Awards. Cassandra Wheeler is proud to stand on the “shoulders of giants” as the 2018 winner of the Anthony R. James Legacy Award. Before his retirement in 2008, James, the 2004 Black Engineer of the Year, served as executive vice president of Southern Company, one of the largest producers of electricity in the United States. After serving six years in the U.S. Air Force, Wheeler joined the Southern Company and quickly established herself as a trailblazer in the utility industry. In 2012, she became the first black female plant manager for the Alabama Power Company. Two years later, she was promoted to plant manager position at Hammond, making her the first African American female plant manager for the Georgia Power Company. “I was raised by my grandmother and single mother in Mobile, Alabama,” Wheeler said in her speech accepting the Anthony James Award. “My grandmother had an eighth-grade education, yet she was one of the wisest women I’ve ever known. Setting high standards and achieving goals was instilled in me at an early age,” Wheeler added. As the plant manager at Hammond, Wheeler assumed responsibility for the operations and maintenance of a half-billion-dollar facility with 150 employees and four coal-fired units capable of producing 860 megawatts of electricity. Within this role, she has managed an annual operations and maintenance budget of $25 million, earning her team a Southern Company Generation “Exceptional Plant” award in 2016. Wheeler began her career at Alabama Power in 2001 as an engineer at Miller Steam Plant. She also served as the plant’s maintenance team leader and operations team leader. Cassandra: I share your achievement with honor. It is great to have known you in person through TWIG. Your example inspires me more to keep faith, maintain humility and strength. I still remember your calm voice in TWIG Kick-off 2018 and now after read the short exert abut your grandmother, I know that if we want to make this country strong, we need to set high standards and teach children moral values in each family from the young age. Congratulation! Again, I am very lucky to get to know you. This is awesome!